Congratulations to Danielle Blum and Silas Mongar, both 9th graders at Bishop Neumann. 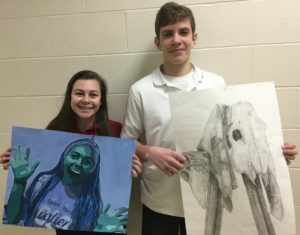 They have been selected as winners at the Nebraska Art Scholastic Contest! Danielle won a silver medal for her tempera painting called, Spirit!. Silas won Honorable Mention for his pencil drawing called, Two Skulls. They will receive their honors on, Saturday, March 2nd. Their work will be exhibited on the 2nd floor of the of TAC building, 3215 Cuming St. in Omaha. The exhibit will be from February 26-March 29th. They are the students of Mrs. Mary Lorenz.